It is best not to be in a hurry to plant or harvest this delectable king of vegetables. Warm soil and sunny skies are a must for growing sweet potatoes and with an average of 100-120 days to mature, patience is definitely needed. 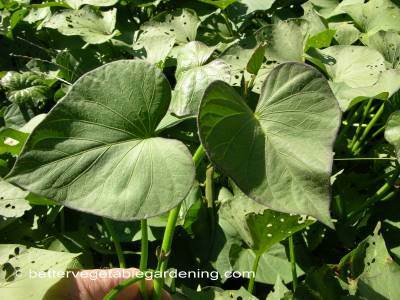 The sweet potatoes foliage consists of alternate heart-shaped leaves growing on trailing vines. 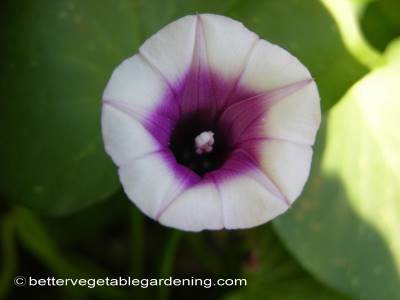 Although sweet potato flower are few and far between they are the same medium-sized funnel shaped flowers common to many members of the Convolvulaceae family. There are many different varieties; most common are those that grow on trailing vines putting down roots at the nodes as they sprawl out quickly covering the soil. Other varieties are bush and semi bush types; these are well suited to gardens with limited growing space. 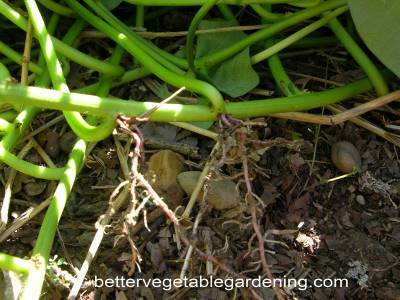 The roots forming at the node points that hit the ground will grow tubers. 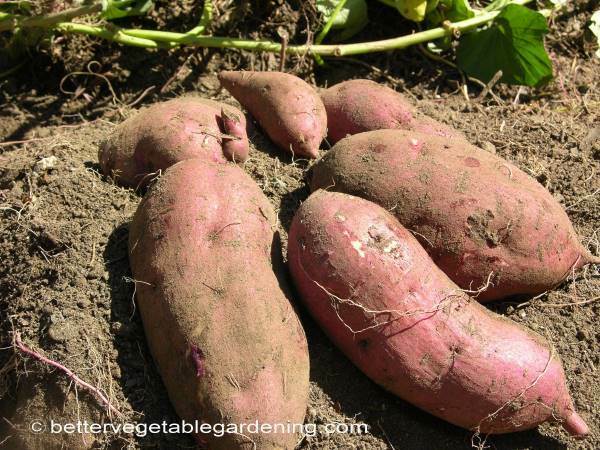 It is common to find mature tubers far from the actual plant at harvest time. The edible tuberous root is long and tapered, although orange fleshed varieties are most common today there are also white, yellow, and purple. The sweet potatoes skin is normally smooth with colors ranging from copper, red, different shades of purple, brown, orange and white. The most common sweet potatoes grown and eaten today are the light orange skin with deep orange flesh. It is a common misconception that sweet potatoes and yam's are the same, however, although they look similar, they are not even distantly related. Step away from that sweet potato transplant. Dont even think about putting out your very frost tender sweet potato slips until at least 3-4 weeks after the last average 32 F (0 C) freeze in your area and not before soil temperature are consistently 70 F (21 C) or above. Sweet potatoes are tropical plants that are very sensitive to cold weather. 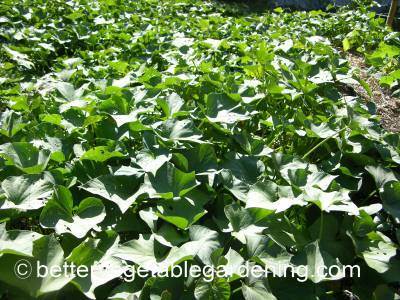 Grow sweet potatoes in full sun, they requires, no, they demand, at least 8-10 hours of direct sunlight daily. 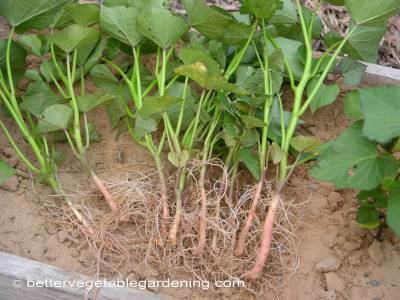 Sweet potatoes are the ideal crop for areas with sandy soil. The best soil types are well-drained, fine sandy loam. 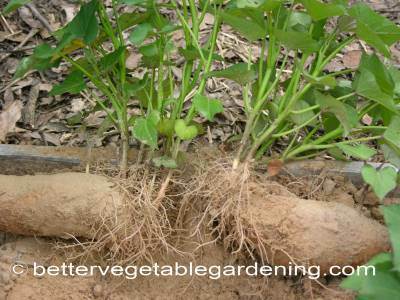 These soils usually grow roots with better shapes than those grown in heavy or clay soils. The optimal pH for growing sweet potatoes is 5.8 to 6.2 but will grow in soil of 4.5 to 7.5. Transplant slips - 12-18 inches (30-45 cm) apart with 3-4 feet (90-120 cm) between rows. Sweet potatoes can tolerate periods of drought, but regular weekly watering is important as plants grow and can spread over a large area. As the crops matures towards harvesting reduce the amount of water during the final 3-4 weeks, to keep the mature tubers from splitting. 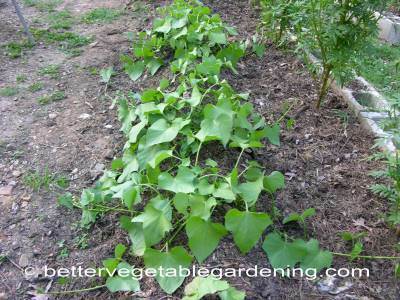 The most common vine type sweet potatoes will only need mulching on the mounds in the initial transplanting period. It isn't long before the vine growth takes over and covers the ground eliminating all but the most persistent of weeds. 2 weeks before planting apply 2-3 quarts per 100 sq feet (2.2-3.3 liters per 9.3 square meters) of All-Purpose 5-5-5 Organic Fertilizer. Use liquid starter fertilizer at time of planting slips. Side-dress after plants have begun new growth and begin to run, with same rate as initial application. Alternaria leaf spot, Black Rot, Fusarium Wilt, Scurf, Bacterial wilt. 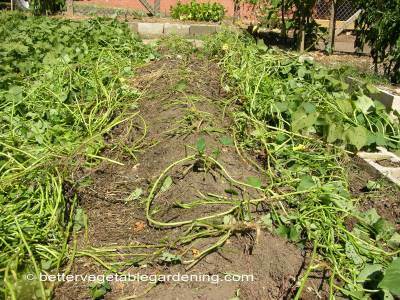 Sweet potatoes, depending on conditions and variety, will be ready to harvest in 90-150 days after transplanting the slips. The time to start harvesting is just as the ends of the vines begin to turn yellow. Harvest before the first freeze or even cool temperatures, because this will reduce the quality of sweet potato tubers and their ability to keep. You will need to clean off the foliage before you can start digging up your precious sweet potatoes. Be careful when digging sweet potatoes to avoid injuring the tubers. Using a garden fork to loosen an 18-inch (45 cm) wide circle around the center of the plant. 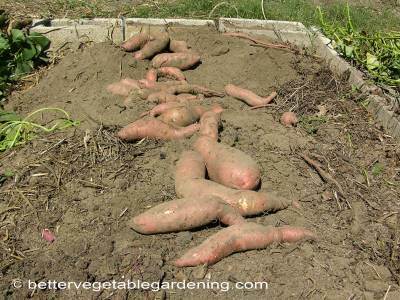 Once the soil is loosened use your hands to gather up the sweet potatoes. 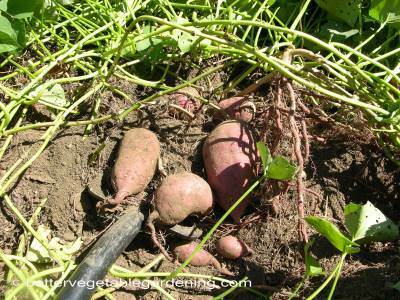 Sweet potato tubers should be allowed to dry on the ground for 2 to 3 hours after being dug. After the initial drying period they will then need to be cured. This is done by removing any excess soil and laying the unwashed tubers in a warm 80-90 F, (27-32 C) well-ventilated place for 10-14 days before being stored. During the curing process any scratches or cuts should be healed, if not use those tubers first before they spoil. 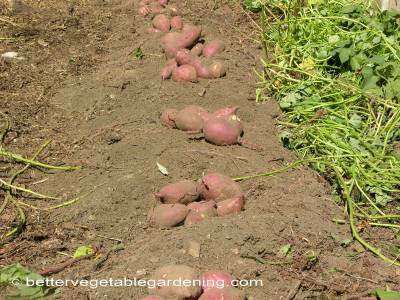 After the curing period move your tubers to any area that stays cool and dry. Do not refrigerate or store below 50 F (10 C). Properly cured and cared for sweet potato tubers will keep for up to 6 months when stored at around 60 F, (16 C) with high humidity.